Office buildings in the San Diego area soak up the California sun daily. While sunshine is enjoyable, over-exposure can fade anything inside your office and lower visibility to your computer screen. Solar Art offers exterior window film that reduces the sunlight coming inside without blocking the view of San Diego. Exterior window film is a smart investment that is attractive on buildings of all sizes. Our product guards your building while adding a slick, modern look. It adds privacy for your occupants as they use computers without distraction of glare from sunlight. By blocking the extra light and heat coming into the office, you don't have to keep the building's thermostat turned down and your employees can concentrate without glare on their screens. When you conserve this much energy, you may be eligible for a utility rebate from the San Diego utility authorities. Exterior window film from Solar Art in San Diego is much like our interior window tint and other film applications. 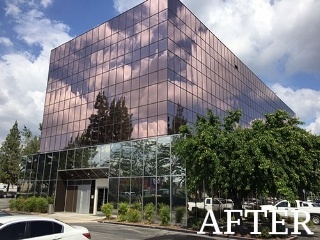 No matter what color or kind of building wrap, every one of them improves the appearance and function of your office. We use the windows you already have to start the installation process, so you don't have to spend money on brand new windows. No matter the scale of your glass, we fit our film precisely to each window panel. No matter how big your office is, we've got the skills to finish the job quickly. Our exterior window film is available in many different shades of tint and can be mixed and matched. Film applications can help your property in several ways. In many situations, our clients witness a decrease in their HVAC costs, happier employees without screen glare and extra privacy for all tenants. 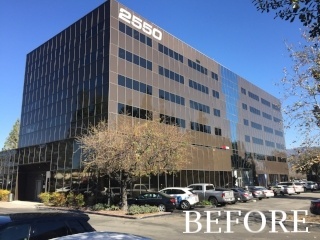 No matter the size of the building, Solar Art is prepared to help companies across the San Diego region with quality refinishing for interior and exterior windows. Our helpful sales reps are standing by to give you more details and a no-cost quote today.